As you may know, attacking the Imperial City is Molag’s Bal desperate attempt at Planemeld, the pulling of Nirn to Coldharbour. The iconic White-Gold tower is now obviously under a lot of stress, what with the attempt of pulling the world to Coldharbour and everything. The actual Tel Var Stones are small, magically-imbued fragments of the White-Gold Tower its self, scattered all around the Imperial City. Tel Var Stones are said to “possess magicka and mystical varliance in a previously-unknown combination of arcane power”. That must be why they are so valuable to Molag Bal’s minions, too! Killing Cunning Imps in the Imperial Sewers before they reach a portal supposedly gives a larger amount of Tel Var Stones. Killing players of an opposing alliance is a sure way to get all of their stones. Completing quests in the Imperial City that reward a Tel Var Stone Box. There’s also treasure chests in the Imperial City that contain Tel Var Stones. It should be noted that the monsters in the four-man group dungeons, the Imperial Prison and the White-Gold Tower, do NOT drop Tel Var Stones. Your average monster in the Imperial City drops four Tel Var Stones, whilst a boss usually drops 400 of them. The stones are also shared evenly between the players who take part in killing the monster. 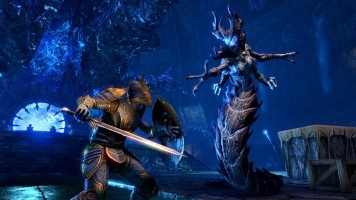 Since Tel Var Stones cannot be traded or mailed between players, it looks like the only way to rack the currency up is to risk the PvP areas of the Imperial City – whether you choose to stick to monster slaying, or picking on players of opposing alliances, the risk of being attacked by another player will always be there. There will be quests, some of which will be repeatable, that reward Tel Var Stone Boxes. These boxes are NOT lost on death, so this will be a relatively safe way, probably the safest, of obtaining Tel Var Stones. The thrill (or the annoyance, depending on how you look at it!) of the new currency is that you could lose it all in the blink of an eye. If a monster kills you, you’ll only lose 10% of your total Stones, but should another player kill you, you’ll lose ALL of them. At this point it’s unclear what happens if say, players attack you, but a monster gets the killing blow on you. Technically you were killed by a monster and would therefore only lose 10% of your currency, but at the same time the real cause of your death was probably the players in the opposing alliance. There’s a special interface in the Imperial City which allows you to see your current Tel Var Stones and the multiplier. Tel Var Stones don’t actually take any inventory space, and you don’t have to physically loot them. The greater the risk, the greater the reward. It’s up to you to decide whether you want to deposit your stones in bank or push for another threshold and potentially double your current stones. Depositing Tel Var Stones in personal bank resets the Gain Multiplier but also means the stones will not be lost, should you die in the Imperial City. Every Alliance sanctuary within the Imperial City has a Tel Var Stone exchange room. This is where the currency is spent. The Tel Var Armorer merchants sells superior-quality items while the Tel Var Great Armorer merchants sells epic-quality items. If you feel like gambling, you’ll be quite fond of these vendors. The Tel Var Lockbox merchants sell lockboxes which contain a random set item for a specific set of the six new sets. You can choose the set, but you can’t choose the specific item or item slot. You might get lucky, but then again, you may not. The Lockbox merchant sells green-quality lockboxes and the Greater Lockbox merchant sells blue-quality ones. These merchants are your merchant of choice if you’re into crafting. The general merchants sell VR15 and VR16 crafting materials for all professions. They also sell the Charcoal of Remorse which is one of the required components for creating armor and weapons in the new Xivkyn style. The special and expensive item here, however, is the Sigil of Imperial Retreat. Perhaps you could guess what it does; upon use it teleports the player back to the player’s alliance sanctuary within the Imperial City. It isn’t instant, it can only be used within the Imperial City and is also consumed on use. The Sigil of Imperial Retreat allows the player to bring the Tel Var Stones back to safety. The new set items and Charcoal of Remorse can be traded between players, but the Sigil of Imperial Retreat cannot.